If you want to explore the unique nature of the Algarve on a fantastic boat, visit the caves, take beautiful pictures and watch a graceful sunset by the sea then this Benagil Boat Trip is perfect for you. You will explore the diverse beauty of this unique coast and visit the fascinating caves, beaches and dramatic rock formations with the most impressive of all. The boat leaves Portimao and sails west, towards Benagil. On board, you can enjoy chilled spring water, soft drink or fruit juice and a snack while taking your pictures and using our wireless internet. When the sun goes down, the captain will put the boat perfectly in the inspiring sunset. After sunset, it goes back to Portimao. If you feel like amazing and awe-inspiring your holiday, this unique tour is for you. Also, your Instagram followers would never stand for the competition. Are you ready for a Benagil cave ride to Marinha? Benagil Boat Trip from Carvoeiro to Marinha is the perfect tour to discover the famous Benagil Grotto and the Southern Algarve coastline from Carvoeiro to Marinha. During the holiday on the south coast of Portugal, a visit to the most beautiful caves in Europe cannot be missed. Boat tour past the Benagil caves to Marinha takes about 1.5 hours and starts in Carvoeiro. 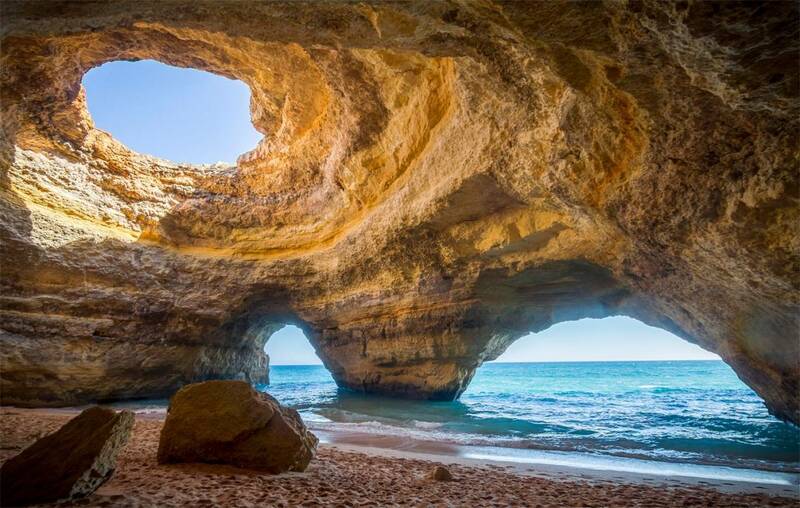 The Algarve coast is known around the world for its impressive rock formations and grottos. The Benagil Grotto is the most famous of all the rock formations in Portugal and a visit to this is one of the absolute highlights of the many things to discover in the Algarve. This 1-hour Benagil Boat Trip ride is the best way to discover the coastline of the Benagil region. The journey starts in the picturesque fishing village called Carvoeiro. The Benagil cave ride allows comfortable boarding and disembarking and is therefore suitable for all ages. Benagil cave ride is one of the best things you will experience during your holidays with friends or relatives. To make the holiday in the Algarve unforgettable, book a Benagil cave ride as soon as possible. • Boat tour along the paradisiacal beaches and caves of the Algarve. • The Tour starts from the idyllic fishing village of Carvoeiro which is definitely worth a visit. • Well-trained, young staff that make this trip unforgettable. • Live comments during the tour and safety instructions from the captain. • Sun protection and comfortable clothing must not be missing. • Unfortunately, swimming is not allowed on this trip. • Do not forget a camera to share the beautiful impressions at home. • Safety briefs and life jackets are included in the price. • Meals are not included, but you are welcome to bring something. • We recommend booking in advance to avoid booked-out trips. • At least 15 minutes before departure you should arrive to check in Carvoeiro. Thus, Benagil Boat Trip is a perfect trip to enjoy the epic Benagil cave on a stunning cruise.